Living alone with her depressive father in South Carolina, high school athlete Cyd Loughlin (Jessie Pinnick) longs to get away. As a result, she relishes the chance to spend a few weeks with her aunt, famous novelist Miranda Ruth (Rebecca Spence), in Chicago. Princess Cyd is an atmospheric and deeply thoughtful coming of age story from director Stephen Cone. Following the burgeoning relationship between Cyd and Miranda, the film explores matters of the heart and soul, of innocence and experience and of our interior and exterior selves. Largely thanks to the warm and compelling central performances from Rebecca Spence and Jessie Pinnick (a luminous screen presence), Princess Cyd brings these thought-provoking themes to life - showing us the value inherent in the preferences and perspectives of both women. The relationship between a teenager and her middle-aged aunt would suggest the potential for conflict. However, Cone avoids these well-trodden narrative paths. In scenes where we might expect a heated argument (particularly after a careless and insensitive comment), we instead get a far calmer, more insightful response. While this restraint seemed a little unrealistic at times, I welcomed Cone’s refreshing approach. I also loved the way his film allows Miranda and Cyd to learn from each other. The precious time they spent together enriches both women - opening them up to an exciting, potentially more fulfilling future. At the heart of this film lies an appreciation of youth and experience, spontaneity and contemplation, company and solitude. These are the themes that linger and perhaps prevent other events - such as Cyd’s past or her relationship with Katie (Malic White) - from feeling quite as well developed. Princess Cyd is an enjoyable, emotionally engaging film - a charming and thoughtful movie. After watching the film, I immediately wanted to start a regular storytelling soiree. 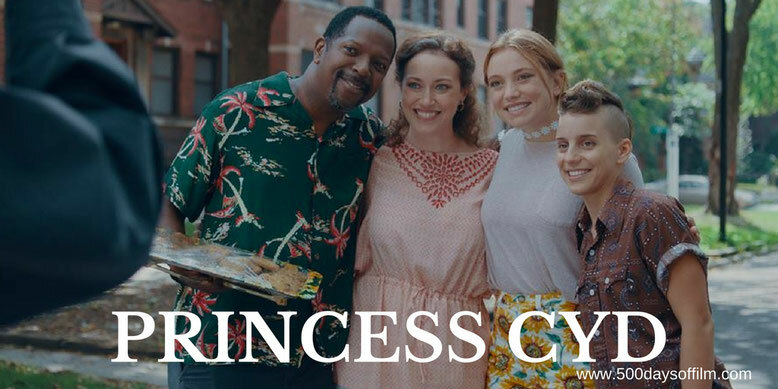 Have you seen Princess Cyd? If you have, what did you think of Stephen Cone’s film? Let me know in the comments section below or via Facebook or Twitter (@500DaysOfFilm). Happy for my cousin jessie!